I'm new to this forum and sought it out after talking to two plastic surgeons about the basal cell skin cancer on about one/third of my lower right eyelid. They both told me that surgically removing it will leave a permanent scar, could require tear duct restoration surgery, could require cutting part of my upper eyelid (or ear!) to patch up the eyelid below. One doctor said "it will look OK," but I'll my eye will never quite look the same again. I am a recently divorced woman with beautiful blue eyes,not willing to accept this diagnosis. I've been reading some of these forum posts but would so appreciate anyone's help in directing me to alternative treatments safe for the sensitive eye area. A lot of people in this forum are interested in topical remedies, creams, etc. applied to the skin. Please just BE AWARE that getting various topicals into the eyes is one of the most warned-against situations. These substances can be very damaging to the eyes, and users on the forum have discovered that APPLYING SUBSTANCES CLOSE TO, NEAR THE EYES, can often result in the substance leaking into the eyes themselves. I feel very sorry for your problem, will say prayers, and hope that you receive good and effective treatment. Thanks for the warning!! If anyone knows of a natural cure that won't hurt my eye, I would greatly appreciate it. I'm not sure how safe really anything will be so close to the eye. I would avoid petty spurge, anything with ammonia (Cymilium), and orange oil. Remedies that I would consider trying are vitamin E with selenium mixed with Alpha Lipoic Acid (ALA) http://www.topicalinfo.org/forum/topic.asp?TOPIC_ID=891 and agrimony http://www.topicalinfo.org/forum/topic.asp?TOPIC_ID=888 but these have very limited user reports. I think Curaderm BEC5 and Sunspot ES are possibilities. I was just surprised by what I found at www.amazon.com , searching for curaderm in all departments. On the first result page was Curaderm, Sunspot, Raspex raspberry skin gel, iodine, micropore tape, and books on skin cancer, hydrogen peroxide, and eggplant. There are lots of reviews for Curaderm, mostly good. Lots of things to consider, be sure to check out any warnings regarding keeping your eyes safe. I wish you well! I hope you will return here and let us know what you are doing for your BCC. I have the same situation, almost EXACTLY! I have looked at the pics of reconstruction surgery and am none too keen on this. Each of the 2 derms, 1 ophthalmologist, and general practitioner I have seen have all said that this is slow growing and won't threaten life or other organs. 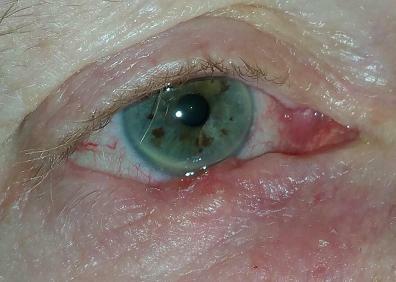 However, it is starting to spread slowly across my lower eyelid, just at the eyelash margin, not below. Since I can't get in for a mohs surgery (and still don't know if I WANT to) for several weeks yet, I thought I would research and try some topical routes. I just started using Liph topical spray, a modified silicate solution with aloe vera and glycerin that has a pH level of 13.7. I use a q-tip and pull the lid away from the eye and hold it there until the solution is dry. I then use another q-tip dipped into an olive oil and fresh-crushed garlic solution and hold that onto the lesion. It burns, but not unbearably. I've done this two days now and my whole lower lid is very puffy, even though i've only used the solution on this tiny spot. I am hoping this is some sort of auto-immune response that is positive. The lesion itself is now looking red (pearly white before) and pitted. So far, no negative effect on my vision in that eye. I tried HARD to talk the derma into prescribing me imiquimod (Aldara), but he wouldn't because of the proximity to the eye. He also said it is only approved for superficial BCC, even though I had academic research papers showing it is now being used for nodular BCC. I may switch to soaking in Epsom salts and following with iodine tomorrow. My father is from the deeeeep south and his "people" cured nearly everything by painting it with iodine when he was a kid. I've read about the iodine treatment and only have to research safety near the eye before using it. Best wishes to you. Please let us know how you are doing. If you do have the surgery, I would really really appreciate hearing about your experience. If my topicals are not successful, I may very well have to have the surgery also. Hi Onelove, thanks for your post. It seems like you are being very careful, but contact with a high pH liquid could be disaster for your eye. I don't know if that would stop me either, but at the minimum be super careful and have an emergency eyewash plan with running water in advance. LIPH is a modified value added silicon based compound. (It is also known as alka hydroxy, alka vita, and alka V6. Do not confuse this with alpha hydroxy which is an acid.) Silica is an "Essential Trace Mineral" known for bone and joint health, naturally produced within the body, and believed to diminish as we age. LIPH toxicity tests and skin corrosion tests confirm that it is completely safe. LIPH is also water soluble and easily absorbed. LIPH increases the production of the body's own primary and most powerful antioxidants... Glutathione, Catalise and Superoxide Dismutase! LIPH is very high in alkalinity (pH +/-13.7), which helps balance the body's natural pH level and helps prevent acidic conditions. They also have an interesting cancer page http://www.liphproducts.com/research-cancer and a melanoma page with a research paper that does not show up on pubmed http://www.ncbi.nlm.nih.gov/pubmed?term=alka%20vita , so beware. I think alkalinity, especially topically, can kill cancer, but 13.7 is getting up there in pH to where normal cells can be damaged. I would hope the topical spray is much more diluted than their other products but I did not see a pH for it. I like the iodine idea. Hi Dan, and thanks for your welcome. I am learning much using myself as a science lab, haha, but given that alternatives, not much choice. I feel extraordinary gratitude for those like yourself who have 'gone before' are generous enough to spend the time to post info and encouragement for those of us who are just beginning to go 'off grid', as my environmental activist son would say. I did check the LIPH spray with my pH tape and it registers off the top of the chart, which ends at 8.0. So it must be super alkaline. I was surprised when they sprayed the back of my hand in the store and it didn't feel any different than any other light aloe solution. Back home and on my BBC lesion it was a TOTALLY different story. Wow. How far I've come in only 2 days. The LIPH stung alot, but I used a q-tip, and always leaning forward facing down so liquid would not flow up into the eye, held the q-tip on and soaked it for awhile. Repeated it about every hour for maybe 4-5 times. The huge change when I followed with an enzyme liquid for cleaning contact lenses, done the same way with a q-tip (yes, I did irrigate eye several times with saline, followed with lubricating protective drops just in case and ALWAYS held lid away from eye and facing down). After the enzyme and rinsing that off with saline, I used hydrogen peroxide. The HP didn't fizz like I expected it to. I checked the pH of HP and found it to be very low/acid. I added a bit of baking soda to the HP and tried again. WOW. It fizzed like crazy and went quite deep. I painted everything with iodine (Lugol's solution) and walked around the house holding my lid away from the eye to simulate a gentle fan. It did hurt and took some deep breathing. I also have been drinking BS in water, along with some salt/potassium and a wee bit of Epsom salt for the magnesium. I test the water to be sure it is alkaline, but not too much. I was shocked to learn from testiing that our 'healthy' (ha) reverse osmosis water is low pH/acid. I've also started taking enzymes on an empty stomach last thing at night and first thing in the morning. This morning my eye is swollen so much it would frighten anyone I know if they saw it. The 'bad' tissue is clearly eroded with this treatment, but I have absolute faith it will heal, as many of you have already experienced. My dear hubbie is soooo supportive, as he knows the alternative if this is not successful, and he knows I was diagnosed with Lymphatic Sarcoidosis at the age of 26 and told I would die within a year, no treatment available but steroids and pain amelioration and I HEALED MYSELF with naturopathic treatments and lifestyle changes. 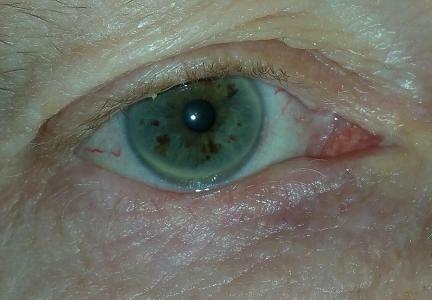 I am now 56 and other than this soon-to-be-history BCC on my lower eyelid, I am pretty healthy. After much research and thought, I believe my many hours at a high-glare/high EMF computer has more to do with this BCC than outdoor sunlight. I will try to limit my time online until I find a low glare/low EMF computer. Anyone know anything about this? - - Blessings to all of you who are workiing at healing, and thanks again Dan for the welcome. I agree with what some have said regarding the dangers of putting some natural treatments (or drugs) in, on or near the eye. You may find the following link with photos of interest. This site does not sell the product mentioned but you can probably find it out there some where. Hope you get a full healing!! doing this 5-8 times a day. The GOOD news is that I saw a MOHs surgeon/dermatologist AND an oculoplastic surgeon several weeks ago who both pronounced the BCC GONE, nothing left to even biopsy. I was pretty happy. That lasted all of one week before it started coming back. I have adjusted to the need to have it removed surgically. One opthalmic surgeon told me of a patient who bad 4 recurrences because the previous surgeon did not get clear margins. I am fortunate so far in that mine is small and no lash loss yet. Given the difficult location of your bcc, I would find the best surgeon and get it done and move on. If is amazing what really gifted surgeon can do these days, and these only get worse over time, generally speaking. If you are not happy with the result after several months, you can have a plastic surgeon do some revision. My friend who is an opthalmologist gave me a tip: have ONE surgeon do both the MOHs and the wound closing. I was all set up to have a dermatologist do the MOHs and then oculoplastic surgeon do the closure/reconstruction. My friend says I will get a better end result with the same surgeon doing both. I know this is a VERY hard pill to swallow, but try to keep in mind that your issue will only get larger/worse the longer you day. Just be sure to keep looking 'til you find the right person. I saw a total of 7 docs before I felt comfortable with one. Now, having said all that, if I lived where it was a viable option, I MIGHT consider the combination of thermal therapy and very low dose radiation instead. There are 2 clinics I know of that do that and they are both in California, but there are bound to be more out there. Good luck to you. Let us know how things go. Melanoma survivor more than 20 years. In addition to sunburn prevention I have found astaxanthin to help kill several of my skin cancers. I started having one eyeball get red on the inside corner, so after some research I started taking astaxanthin and my eye redness went away. After reading a little more I also started taking zeaxanthin to make sure my eye problem completely cleared up (pun intended.) And I started eating more fresh raw vegetables to get their nutrients. While reading about Astaxanthin, I realized it might also work on my skin cancers and boy did it ever. I had a half dozen spots on my face that my dermatologist said were actinic keratoses and had been frozen with liquid nitrogen repeatedly but came back. I think several of them were degenerating into basal cell carcinomas, because a couple weeks after I started taking the Astaxanthin several of these spots became red inflamed swollen patches. I read that this happens when cancer cells die off. After a couple of months taking Astaxanthin the scaly skin disappeared and all these spots became normal skin again. All except a couple of BCCs on my nose that I've fought for nearly 20 years. I expect to try topicals on them soon. I'm almost certain it was the Astaxanthin stimulating my immune system to kill the cancer cells because when I stopped taking it the inflamed spots went away and when I started taking it again the inflammation came back. I take it every day now and no more inflamed spots, just healthy skin. The pills cost less than 15 cents a day at Swanson Vitamins. Ditto for zeaxanthin. Hi, can you please provide an update? My mother is in exactly the same situation right down to the divorce and blue eyes. Any information on what you decided to do would be so much appreciated. This is a new diagnosis and we are just looking for information. Thank you! Hi bwert001, I have a nodular BCC on my lower eyelid which is right on the edge and there is also a part of it on the inside area of the lid facing the eyeball. My experience is that you can use just about any remedy near the eye if you are very careful and go slowly - if your eye starts to water you've gone too far so let it rest and try again later. I have used iodine, petty spurge,black salve, orange oil, frankincense oil, cymilium and bicarb soda washes all very near the eye. Initially the thing that helped the most was orange oil and this kept the BCC under control (but not eliminated)for several months. Then the BCC started to grow again. I am now using the combo approach and apply cymilium morning and night followed 15 minutes later by a mixture of coconut oil, neem oil, IP-6 with inositol and DMSO. The idea is to apply the cymilium and then the following DMSO mix will help to take it deeper into the BCC. As well as this I apply orange oil at night followed by the DMSO mix. I can taste the DMSO and cymilium in my mouth a few minutes after applying the DMSO mix and it is not nice, especially the cymilium. I leave a 15 minute gap so the taste is tolerable. I also take internally digestive enzymes, astaxanthin, D3 with K2 and chinese herbs to boost the immune system. So far the combo approach seems to be slowly reducing the BCC and I hope that using the DMSO mix will also help the part of the BCC on the inside of the lid. My body temperature, which was low when I started, has improved too. I have tried small amounts of black salve on the lower parts of the BCC and it has helped to some degree but it's very difficult if not impossible to apply it the the very edge and keep it there covered for 24 hours without it irritating the eye (and I have tried). Just wanted to post an update. After aprox 4 years of treatment the BCC on my eyelid looks to have finally gone and I am very happy and relieved. Even the part of the BCC which was growing inside has gone! I think the treatments that did most good was the Cymilium, followed by the orange oil. After some success with the combo treatment I probably got a bit lazy and the BCC started to grow again earlier this year so I went back to the Cymilium/orange oil without DMSO and it worked. Too many applications of orange oil seems a bit too harsh on the eyelid and eats away a bit too aggressively whereas the Cymilium is quite gentle and can use a bit of a boost from the orange oil. So to start off I used two applications of Cymilium each day together with one light, careful application of orange oil. Then, when things seemed to be progressing, I stopped the orange oil and only used it when progress stalled. I'll be keeping up the treatment for several more weeks just in case it decides it wants to try to come back. To treat the part of the BCC which was inside the eyelid I developed a complicated procedure. Facing a mirror, I would pull down my lower eyelid which exposed the inner area. I would then apply a very small amount of Cymilium to the area using a long, thin wooden food skewer which I had sanded so the end was very round and smooth so as not to irritate the sensitive inner area. I would then keep holding the lid down for 15 minutes to give the Cymilium time to react. Then I would wipe it away using a cotton ear bud before letting go of the lid. It took a while to get the amount applied correct as too much and the eye would start watering. If I've learned one thing from this process its that different things work for different people, and you usually have to experiment a little to find out what will work in your individual case. The first pic below is from 2015 and the second pic is a few days ago. That's great news. Plus it confirms that sometimes you have to literally beat BCC into submission using patient, continuous treatment over the long haul. I think we all naturally want the fast knock-out result. But I tend to think of DIY treatment of BCC as more of a war of attrition � incremental progress maintained over an extended time period, instead of the dramatic quick fix. For those who want instant results, there's always a Moh's surgeon available to provide it. Thanks for your comments waverider. Yes self-treatment can represent quite a commitment sometimes and it's tempting to give up especially with friends and family urging you to please see the doctor as it's looking quite worrying! I'm not sure where I got it from but I am sustained by the belief that 'for every illness there exists in nature a corresponding remedy' if only you can find it.